MTP cassettes and cable assemblies take their name from the MT connector, designed and introduced as a performance version of MPO connectors. MTP fiber systems are truly an innovative group of products. Each MTP connector contains 12 fibers or 6 duplex channels in a connector that is smaller than most duplex connections in use today. A 72-fiber trunk cable can be terminated with six MTP brand connectors and MTP connectors are manufactured specifically for multifiber loose tube or ribbon cable. 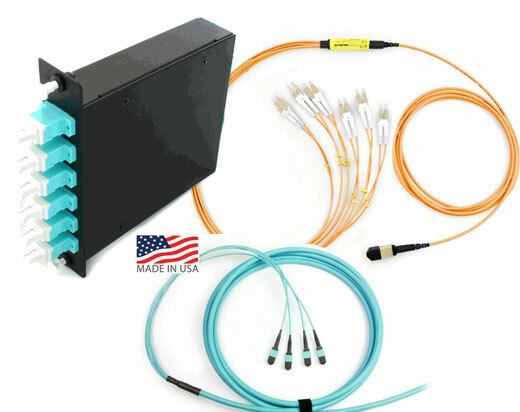 The HD8� High Density Fiber Optic Patching system is specifically designed for ease of installation and economy of space. Patch cables that are perfect for handling the most demanding data transmission requirements featuring space-saving designs that dominate the market today. HiPerlink pre-terminated fiber and copper assemblies provide a simple "plug-and-play" solution for any data center.